A whole salmon can be a spectacular centrepiece for any dinner table, very little effort involved for lot of wonderful flavours. Ask your fishmonger to remove the head and tail if you prefer. Wash the salmon under cold running water and pat dry with kitchen paper. Lay an oversized sheet of tinfoil on a large baking sheet, and drizzle with the olive oil. Place the salmon on the foil and insert the sliced onion, half sliced lemon, bay leaves and tarragon into the cavity. Place the salmon upright, underside down on the foil and position on the tray as you would like to serve it as you need to move as little as possible when baked to ensure perfect presentation. Pour the white wine and lemon juice over the salmon and season with salt and pepper, cover over with foil to create a loose seal. 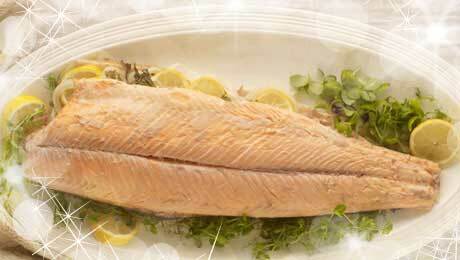 Bake the salmon in the oven for 1 – 1 ¼ hours, remove from the oven and allow to rest for 15 – 20 minutes. The skin may be removed quite easily using a spoon if you wish. Dress with the thinly sliced lemon slices. Serve with some baby potatoes and drizzle with hollandaise sauce, and be vigilant for any stray bones!